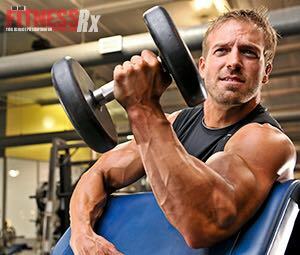 FitnessRX for Men > Training > Workout Tips > Fitness Model Ben Booker Helps You Get Ripped! Fitness Model Ben Booker Helps You Get Ripped! Ben Booker is a successful fitness model who has appeared on the covers of Fitness Rx and Ironman. His day job is as a plumber and HVAC technician, but he is also a spokesmodel for Applied Nutriceuticals and bodybuilding.com. His is a Cinderella story of a young man with alcohol problems who suffered a devastating car accident that left him with a broken back and two months recovery. Following his accident, he started weight training seriously and his physique gradually took shape. After creating a BodySpace profile on Bodybuilding.com and getting encouraging feedback, Ben was convinced to enter their BodySpace Spokesmodel contest, which he went on to win. Soon, Ben had gone from a plumber and family man with alcohol problems to a cover model with endorsement contracts with both Bodybuilding.com and Applied Nutriceuticals. The most effective exercises are the ones that move your body through space, and the wide-grip chin is one of the best. It targets the lats like nothing else. A lot of guys get discouraged because they can only do a couple, so they just do lat pull-downs. They are really shortchanging themselves. “I like doing cable curls one arm at a time or with both arms simultaneously. And just like with the dumbbell, you can use the non-working arm to spot the arm that’s curling.